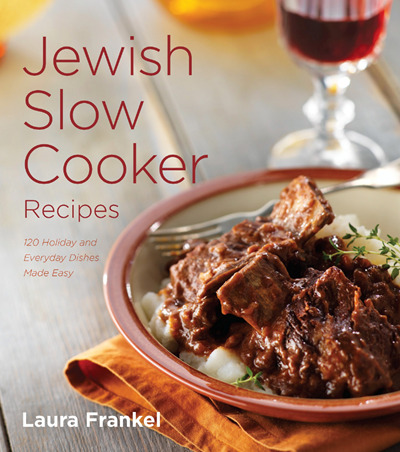 Jewish Slow Cooker Recipes by Laura Frankel collects more than 120 sophisticated, simple, and satisfying kosher dishes. From everyday meals to holiday favorites, each recipe makes convenient use of the humble, ever-reliable slow cooker, using seasonal ingredients that can be found at your local market. When Chef Frankel opened her first restaurant in 1999, she was driven not only by her love of cooking, but also by the desire to prove that kosher food can be as delicious and exciting as any other type of contemporary cuisine. The same goes in her own kitchen. When her family decided to keep kosher, they gave up eating pork, shellfish, and the combination of meat and dairy—but that didn’t mean they wanted to sacrifice flavor. Frankel focused her culinary talents on creating kosher meals that are every bit as refined as their non-kosher counterparts—both at home and at her nationally acclaimed kosher restaurants. But creating inspiring dishes at home isn’t as easy without the elaborate prep that goes into a restaurant meal. That’s why Frankel turned to her slow cooker—a device she had been using once a week to prepare meals for Shabbat, when cooking with the stove or oven is prohibited. Once she realized the slow cooker could produce creative meals all week long, Frankel’s culinary imagination was off and running. The book is divided by course and includes sections on appetizers, soups, entrees, sides, and desserts and breakfasts. For ease of use, each recipe clearly indicates seasonal ingredients and if it is a meat, dairy, or pareve dish. Featuring Frankel’s signature blend of convenience and globe-spanning flavors, these recipes are designed to be kosher, yet accessible to eaters of all backgrounds. Anyone interested in time-saving, family-pleasing meals will find Jewish Slow Cooker Recipes a reliable, inspiring resource in the kitchen. Whether you need a little nosh or a full-on fress, this cookbook has the recipe for you.